Members of the Independent Alliance are to abstain on a vote on the Occupied Territories Bill today. THE GOVERNMENT HAS lost a vote in the Dáil today on a Bill that seeks to ban trade on goods from illegally occupied areas. In a further blow, some members of the Independent Alliance in government abstained from the vote. The government lost the vote 75 votes to 45 votes, with three abstentions. The Bill, does not mention Israel or Palestine specifically, but aims to prohibit Ireland from trading in goods and services from illegally occupied territories by prohibiting “the import and sales of goods, services and natural resources originating in illegal settlements in occupied territories”. 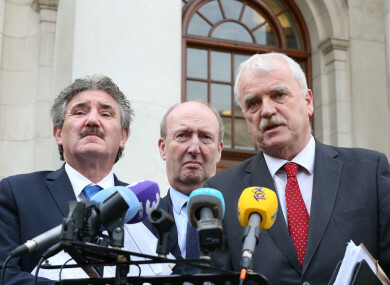 Junior Minister John Halligan said he has long campaigned for Palestinian rights, telling theJournal.ie earlier that he intended to abstain from the vote today. Transport Minister Shane Ross and Junior Minister for Disabilities Finian McGrath also abstained. The ministers sought a free vote on the issue from Tánaiste Simon Coveney, but following numerous talks on the issue over the summer, the members decided to abstain. Halligan said Coveney advised the IA members that their concerns about the impact of members of the Irish government voting in favour of this Bill, particularly from the US, he said. Halligan told TheJournal.ie that he is comfortable with his abstention from the vote, stating that “the important thing is, the Bill will pass”. The only party opposed to the Bill, which was first introduced in the Seanad by Senator Frances Black, is Fine Gael. Had the numbers been tighter, Halligan said it would have been another story, indicating that he may have voted in favour of the Bill. He also confirmed that the issue of the Israeli embassy closing because some members of government might vote in favour of the Bill was raised. Yesterday, Fianna Fáil’s Niall Collins said he “hoped it wouldn’t come to that”, stating that it was “an overreaction”. The Bill, which was produced in the Seanad by Senator Frances Black, “is an important tool in demonstrating that Ireland is opposed to illegal occupations wherever they occur” said Fianna Fáil’s Niall Collins yesterday. Tánaiste Simon Coveney told TheJournal.ie that the advice government has received from the Attorney General is the legislation is “not legally sound”. Speaking in the Dáil yesterday, he said the Bill asks the government to do something that it does not have the power to do, adding that if brought into effect, it faces massive EU fines for differentiating our trade rules. A number of other legal minds, including the former Attorney General Michael McDowell have said the Bill does not contravene European trade law. Ross is understood to have sought further detail on the advice from the Attorney General. Fianna Fáil’s Jim O’Callaghan appealed to the government not to put a ‘money message’ on the Bill which would stall the legislation and prevent it from progressing to the next Stage and being heard in committee. A money message effectively means that the government states that to pass such legislation would cost money to the Exchequer. Opposition Bills are generally not permitted to do so. Fianna Fáil’s Daragh O’Brien told the Tánaiste yesterday that this Bill was delayed last year in order to allow Coveney to raise the issues at European level. Referencing a letter from Coveney, O’Brien said this was not done. He said now was the time to act on the issue, and send a moral message internationally, that might encourage other nations to follow suit. Coveney said it was a “certainty” that a money message would be placed on the Bill – effectively blocking the legislation. He said the legislation has “legal, political and practical” effects. Coveney added that Ireland has a powerful voice at EU and UN level to advocate for the Palestinian people, stating that is where Ireland can help, and that is his priority. Halligan told TheJournal.ie that Independent Alliance members in government would continue to advocate and put pressure on their Fine Gael colleagues to progress the Bill. People Before Profit Paul Murphy said if the words of Halligan and other members of the IA mean anything over the last number of years they would be “tripping over themselves to vote yes” today. Email “Government loses vote on Israeli goods trade ban Bill, as ministers abstain”. Feedback on “Government loses vote on Israeli goods trade ban Bill, as ministers abstain”.